Get Your Child the Best Dollhouse Furniture & Accessories! Dollhouses can provide children with many hours of enjoyment. They love creating different scenes and acting out conversations and scenarios with their dolls. One aspect of fun for a child is rearranging the furniture within the dollhouse to suit their own taste. Children love to change the furniture and accessories to suit whichever game they are playing or scenario they are trying to create. While it is possible to choose from a wide range of dollhouses with furniture included, there are others where you must buy the furniture separately. Even if your chosen dollhouse comes with furniture, you may wish to buy additional pieces or accessories to allow your child to further customize their little house to their own tastes or add more play options. Fortunately, there is some fantastic dollhouse furniture available in a variety of sizes and materials. There are even dollhouse furniture kits if you prefer to make your own. In most cases, Barbie houses come with furniture. 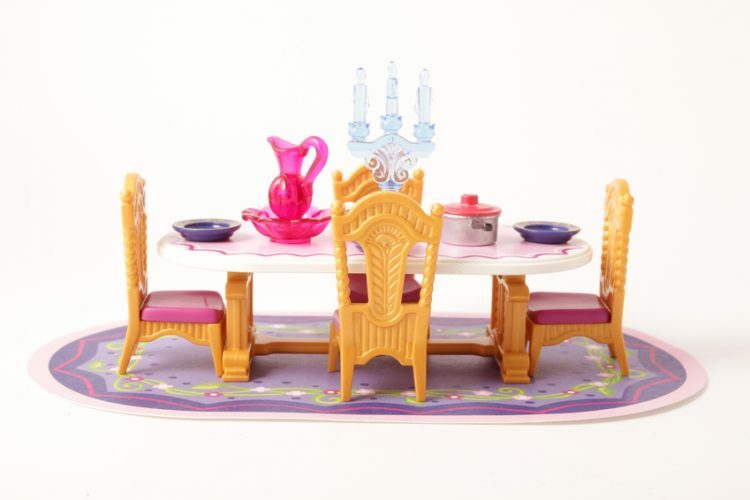 However, there are some fantastic Barbie house furniture sets available so a child can personalize their dollhouse. 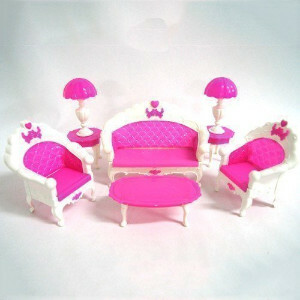 Most of the Barbie furniture is plastic and either Barbie pink or complementary pastel shades. The furniture is usually sold in room-specific sets rather than individual items of furniture. For example, there is a nursery set available for children that want to swap the basic bedroom furniture for items you would typically find in a nursery. The majority of the Barbie dollhouse furniture is suitable for any Barbie house or Barbie Dreamhouse as both the furniture and the houses are designed with the size of Barbie dolls in mind. However, it is always worth checking the product specifications before buying, especially if you are buying an item of furniture that is not sold by the Barbie brand and simply states that the furniture is for Barbie-sized dolls. 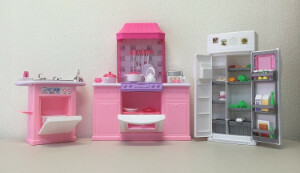 In addition to the official Barbie furniture, there is plenty of Barbie-sized dollhouse furniture for sale that is suitable for dolls of 11 ½ -12 inches. These are sometimes a good option if you are looking for cheap furniture or if your child wants to accessorize their Barbie house in furniture in colors other than the traditional Barbie pink. There are items of furniture and full room sets available for every room in any model of Barbie Dreamhouse. If you prefer wooden dollhouse furniture, then KidKraft dollhouse furniture is probably a good choice. They have a pretty range of wooden furniture that includes both furniture sets and individual pieces. Each piece of furniture is painted white with touches of pink. For example, the Tiffany Bow Doll Cradle is white with pink bow design on the side and white and pink bedding. Similarly, the Lil’ Doll Bunk Bed is white with a carved design at each end of the bed and pink and white floral-patterned bedding. KidKraft dollhouse furniture and accessories are far from the cheapest option. However, you are paying for the quality of the pieces. These are not basic furniture sets that are sold by many of their competitors as they are beautifully designed and there is attention to detail. They can be purchased in smaller pieces if you are after dollhouse replacement furniture. The Lil’ Doll Table and Chair Set has curved table legs and the chairs have scallop detailing and a carved design in the back of the chair. The one downside to the Kid Kraft furniture is that there is not an extensive range of items to choose between in comparison to some of their competitors. Some parents would view this as a positive, though, as it means there are fewer pieces to collect. Anyone who has ever bought Melissa & Doug toys, such as the Melissa & Doug train or puzzles, will know the quality of the products they sell. Their range of wooden dollhouse furniture meets the same high standards as their other products. Unlike other dollhouse furniture manufacturers who produce items that all have the same style, Melissa and Doug dollhouse furniture and accessories are available in a range of styles. There is both traditional and modern dollhouse furniture to suit your child’s preferences or to match the style of their dollhouse. Although Melissa & Doug do sell dollhouses with furniture, their range of wooden dollhouse furniture means your child can mix and match the furniture and rearrange the rooms to their heart’s content. Even better, their furniture is affordable even though the quality is of a high standard. 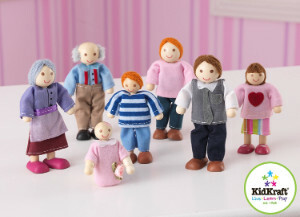 You can also buy additional dolls separately so your child can include more characters in their scenarios. Many dollhouse manufacturers produce doll houses designed for princesses, such as castles, mansions or palaces. Some come with princess furniture included but there are others that you will need to buy the furniture separately. Even if you have a more traditional dollhouse, your child may still enjoy furnishing it with a princess theme. Fortunately, there are some fantastic Princess dollhouse furniture sets and individual pieces to choose between in every size, from miniature doll furniture to 18-inch doll furniture. Some princess furniture is wooden and others are made from plastic or mixed materials. It is often better to buy the same brand of dollhouse furniture as the doll house itself so that you are sure the furniture will fit in the house and so the style matches. 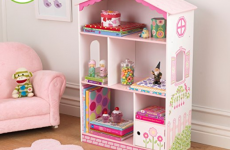 Everything from a bed to a dollhouse bookcase is available in a princess theme. The price you will pay for princess furniture depends largely on the brand you choose and the material the furniture is made from. 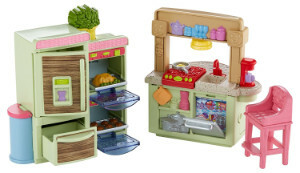 The Fisher-Price Loving Family range of dollhouse furniture is fun, colorful and durable. This plastic furniture is available both in sets for rooms or as individual pieces. These are ideally suited to toddlers and younger children. The Loving Family furniture is perfect for anyone who is looking for cheap dollhouse furniture as Fisher-Price produce some of the most affordable sets available. In addition to the usual furniture sets produced by many toy manufacturers, there are also some more unusual options, such as the nursery or laundry room sets. There is the option to buy outdoor furniture for your dollhouse too, giving your child even more play options. For example, there is a Loving Family Outdoor BBQ Set. The furniture is not the only way your child can personalize their Loving Family dollhouse as there are some fun accessories you can buy. You can even purchase a whole family of dolls and a family car. Dolls are available in a range of ethnicities meaning your child can relate to their own cultural and family experiences in their play. If your child has a dollhouse in a Victorian style, then you will want to purchase furniture that matches this style. You will have no problems in decking out your dollhouse, regardless of its size, because there are individual pieces and furniture sets available from 18-inch dolls furniture right down to miniature dolls furniture. Some of the best-known doll house brands produce furniture in a Victorian style. A great example of this is the Classic Victorian range by Melissa & Doug. The wooden and upholstered furniture can be bought in room-specific sets or a 35-piece set that includes enough pieces for all the rooms in their Victorian dollhouse. Another great choice is the furniture kits by Greenleaf. These are fantastic if you have a creative streak and want to create the pieces yourself. Again, these are available in packs of furniture for specific rooms or larger kits that contain everything you need to furnish a whole dollhouse. Anyone with a miniature dollhouse will find a vast range of furniture sets to choose for their little house that is produced by both well-known brands and lesser-known companies. Furthermore, dollhouse enthusiasts can find some really interesting miniature accessories, such as the Odoria Miniature Blue World Globe with Wooden Stand or the International Miniatures Ornate Gold Victorian Wall Mirror. These are the perfect way to customize a Victorian-style doll house and make it your own. Buying dollhouse furniture is the perfect way to customize your mini house. Spending time choosing and rearranging furniture is lots of fun for children with toy houses and adds to the different scenarios they can act out in their play. Similarly, adult dollhouse builders, collectors, and enthusiasts can enjoy an equal amount of pleasure from buying or creating their house furniture. There are plenty of accessories that both children and adults can choose between to completely personalize their dollhouse. In most instances, it is wise to buy the furniture that is the same brand as the dollhouse. So, if you have a Barbie Dreamhouse you should have Barbie dollhouse furniture and if you have a Melissa & Doug dollhouse the furniture from the same company will coordinate perfectly with the style of the dollhouse. The Loving Family furniture is ideal for toddlers, while Barbie furniture is well-suited to older children and preteens. KidKraft and Melissa & Doug furniture will suit all ages. However, most furniture that is designed for toy dollhouses is sturdy and will stand the test of time. This means the majority of the furniture will last a child from their toddler years to their teens. Choosing new furniture for your dollhouse is a great way to give the style an overhaul as you can give it a completely new look. If you want to create a classic and traditional look, then Victorian dollhouse furniture is a simple way to create this style. On the other hand, your child may enjoy playing princesses and finding princess-themed furniture will help them to completely transform their basic dollhouse and make it the perfect dwelling for a princess. 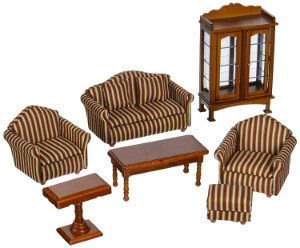 There is dollhouse furniture available within all price ranges. This means that you can buy cheap dollhouse furniture if you are on a budget or spend a little more for special occasions or as a treat. Children may even enjoy saving up for individual pieces or furniture sets with their pocket money. To check out some super cool dollhouses for kids click here!